Recently I found couple of applications that have that nice feature when you swipe item on list view you get menu with additional options that you can click and perform an action . I checked out Android Arsenal to see what libraries are already available for this functionality. I found two interesting implementations : SwipeMenuListView and SwipeListView. In this article I shall show you how you can use this first one and discuss little bit what I liked and disliked in this implementation. Latter one I shall leave for another article. For SwipeMenuListView you can find source code on a GitHub, also you can find some demo code. I modified little bit this demo code so that I can test it and present it in this article. First let us start with importing this library into our project. This is pretty simple, all you need to do is checkout the project, take all classes from the package com.baoyz.swipemenulistview, create same package in your project and copy these classes. That’s all, no need for any additional configuration. 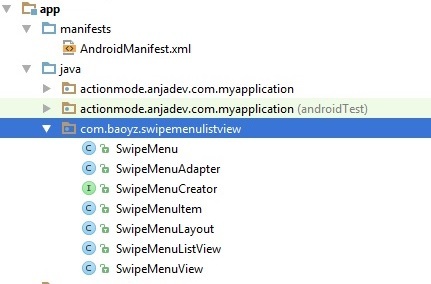 This is pretty simple, if you look at the implementation of class com.baoyz.swipemenulistview.SwipeMenuListView you shall see that it extends ListView class, this means that all attributes of the tag ListView should be applicable for this implementation, but I have not found any attributes that are custom for this component. for purpose of presentation we shall create one more layout that will be used for each row in a list view, later we shall define adapter and use this layout. First part of method onCreate represents setting the layout, fetching the SwipeMenuListView from defined layout, defining list of values for items in the list view and instantiating adapter for SwipeMenuListView. Second partof the code defines SwipeMenuCreator. 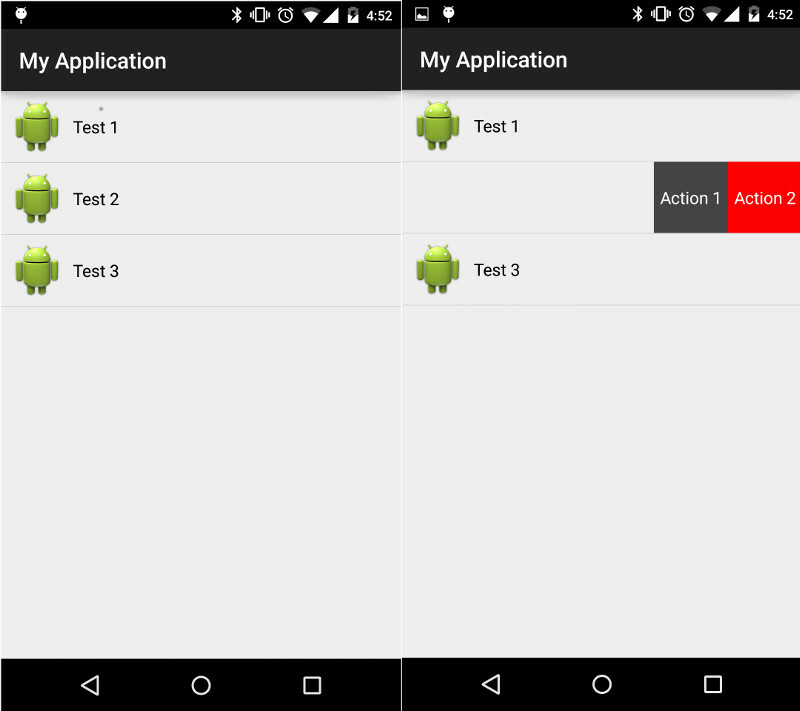 For this class you have to ovrerride createMenu method that has a parameter of SwipeMenu class. SwipeMenu represents a list of items defined as SwipeMenuItems (options in the menu that represent actions), this menu is showed once you swipe an item of a list view. For each SwipeMenuItem you can define: id, icon, background, title, title color, title size and width. Width is defined in px so in the example on GitHub authors provided a method dp2px that you can use. After you set MenuCreator, next is to define and set OnSwipeListener for SwipeMenuListView. OnSwipeListener is an interface that has two methods defined: onSwipeStart and onSwipeEnd where you can override and define certain actions, in this example we have left them empty. Final step in setting up SwipeMenuListView is to set OnMenuItemClickListener. In this listener you are defining actions that are to be executed on selection of each item in the swipe menu. All what is needed here is to override method onMenuItemClick. This method provides as a parameter index that identifies item that is clicked and position of the item from SwipeMenuListView. Once you define this listener everything is ready and should work perfectly fine. Below you can see an screenshot of application we described here. Now what I would like to see as enhancement of this project/library is that we can define our menu items using xml layout file.N, looking at the limitations on this library there are some that can be solved in future releases, one of them is a number of items and width of and item you can have in the swipe menu, in a way it is limited by the width of your screen, so if list of items in swipe menu go beyond the border of the screen after swipe, you will not be able to select them. In that way, another enhancement that I would like to see here is that once swipe menu is opened you are able to swipe trough the menu list and position yourself on a item you want to select. Next time we shall look at another library that provides same functionality. for 3 listview iems it works perfectly.when we want to perform 20 listview items i got position problem plz tell me how to overcome this problem. What do you mean by position problem (what is happening exactly)? Also post a part of your code that you believe it is making problem. this is the array list… but in the application, the position of these items are random and also some of the items disappear as well.. Can you help me?? Very good your tutorial! I’m just a problem in the presentation of the lines, when I use the com.baoyz.swipemenulistview.SwipeMenuListView view the text and the image of the lines is repeated. I’ll post a picture to illustrate what I mean. Do you know if there is a bug that? When I use the common ListView not have this problem. Can you post some of your code, it will be easier to check the problem. * O DAO do Usuário. * A lista de empresas. * O Comparator que ordena por quantidade de PA.
// Primeira ordenção da lista ordena por PA.
// Inicia o chat com a empresa selecionada. I need to implement swiping from both the sides to show different menu options. How can I do this? Please advice. Thanks. How can I add a custom view as a menu item. I have a layout(xml file). I want to show that as menu when user swipes the list row. Is it possible ? I think I mentioned at the end of this article that this is currently a limitation to have your custom layout as option menu that shows up after you swipe element. Maybe there is a newer version now of this library. Please check. Do I need to purchase license to use this library in my commercial android application. Not sure that this is possible in this library. You can do this by setting “setOnItemClickListener” to swipeListView and override onItemClick. This will open the new item and close the previously opened. Can you provide a code of deleting an element in swipe list view?